So, after a very long break, I’m back here to provide some chills going on in the smartphone market. The smartphone world today, is some or the other way completely mixed up, ALL OF THE SMARTPHONES (in their respective price ranges) ARE SAME! People can see a wide range of same phones having same processors, screen size, resolutions, camera quality, etc etc…Though their manufacturers are quite different. People who can’t afford a SNAPDRAGON loaded device prefer to buy MEDIATEK ones, which provide nonetheless same experience with their Octa-Core or Quad-Core processors. But, now there has aroused need to change this preceding tradition. And so is the answer to this question; SMART HOLOGRAPHIC PHONES! 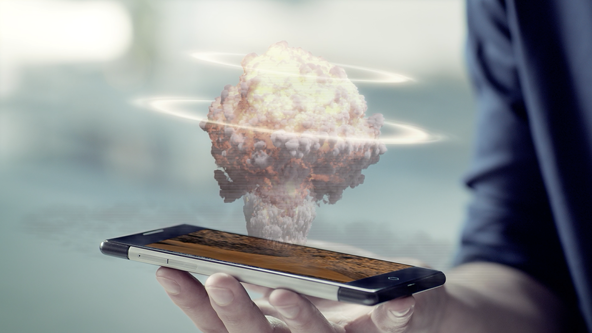 What is a Holographic Interaction Display For Smartphones? Introduced by APPLE, more advanced than the former one + most widely used today).These have succeeded to provide masses a new change in their phones. HOLOGRAPHIC DISPLAY: the new type of DISPLAY TECHNOLOGY that can track the position of Human Eyes, which in turn creates the illusion that the viewer is looking at the real person/object. As mentioned above, this technology is fully based upon the position of Human Eye; it is currently unable to provide a consecutive view from different directions at the same time. That is, the illusion field generated is limited to the eyes of a single person and provides the best experiencing only to a SINGLE PERSON. So, we’ll call it as SMART HOLOGRAPHIC or PERSONAL HOLOGRAPHIC DISPLAY.Let’s get more aware and included. Where can Smart Holographic Phone be used? Will the use of this technology be real? Or is this just a Stunt Trick Hoax played by phone developers? Holographic display relies on light intervene and diffraction to reproduce 3D image of a projection; while Naked Eye 3D uses the principle of grating, requiring video source to be processed. The video source of Naked Eye 3D can be converted from 2D videos, but it requires viewers to be at a specific angle and distance in order to experience 3D effect. Even though, the technology of Naked Eye 3D has passed over a lot of improvements over past years, reports still includes dizziness and vomitive experience of users. These negative feedbacks impacted user experience. As a result, this became more of a stunt than of real-practical-use. When it will be releasing in markets ? You really could write better, not meaning to be highly critical but still… “well it’s certainly for sure” you see how redundant that sounds. Anyhow just giving some feed back on how rough it was to read this.